The 2000 Season pockets reviewed. The 1999 season ended up with these feldspar pockets at the bottom of the headwall. Only q. xtals, columbites and some acicular phenakite needles were found in them. April 2000 started much as 1999 ended. We found more feldspar pockets. But under them was a new quartz beryl zone. There were many blue and green beryls in matrix. In May we were back to work. On May 14 Mary Freeman found this small and unusual pocket. (10cm) Two small beryls were in the open space created by 2 microcline xtals. The left picture shows the pocket as it was found. This was something new for the Orchard Mine. This pocket was located near the floor at the hanging wall. On May 16 we found another pocket feature that appeared to be filled with quartz. Probing it, we found the quartz was a cookeite like material with a dark grey exterior. Inside gemmy beryls lay factured. 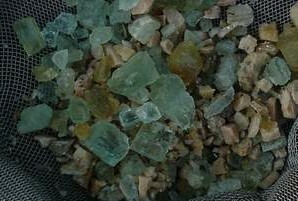 We were able to recover fragments like these. On May 18 we found several pockets in the new headwall. Beryls can be seen laying in the decomposed feldspar. We found a series of pockets over the following 3 days. If we had it to do over again we would have used wooden probes to extract the beryls wedged in the mud and crevices of the pockets. After these pockets, I made a hose attachment for our electric water pump. This hose is an invaluable aid in cleaning pockets for careful specimen recovery. The pockets lower to the pit floor produced crystals that were less etched. Unfortunately the rainy weather disabled my digital camera and the lower pockets were not photographed. 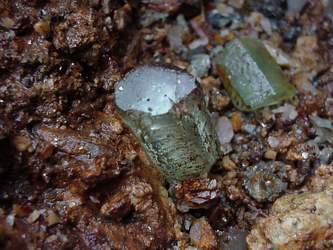 They were not mud filled and frequently conatined smoky quartz crystals along with the beryls.